This may be the classiest I’ve ever seen my avatar look! I love the new collection from Fishy Strawberry for Modavia Fashion Week. The Tie Neck Blouse (in Desert Sand) can be worn alone or with the matching Fluffy Open Cardigan. I like it worn all together, with the matching High Waist Pants, too. I can’t wait for more colors of this collection from Fishy Strawberry! I love clothes that are elegant and photographs well. I’m pairing this look with some new Dark Mouse jewelry, available at Jewelry Fair 2011. I liked the simple but beautiful Rever en Blanc set that includes Earrings, Bracelets, and a Necklace. Fishy Strawberry – Tie Neck Blouse (Desert Sand) NEW! Fishy Strawberry – Fluffy Open Cardigan (Desert Sand) NEW! Fishy Strawberry – High Waist Pants (Desert Sand) NEW! 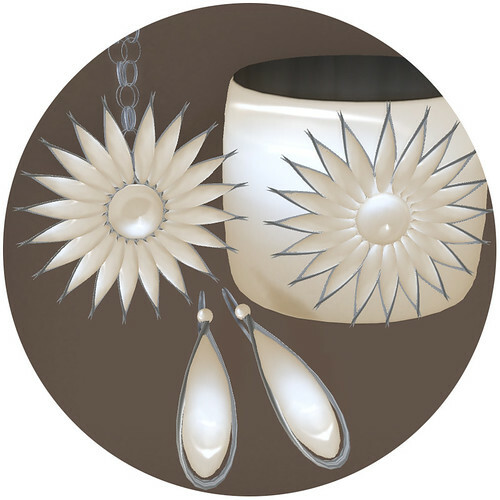 Dark Mouse – Rever en Blanc (Jewelry set) NEW! Absolutely love this look on you! Perfect!